Watch children amuse themselves for hours with our large range of over 100 vehicle related toys. Children will love to play with Kaplan's selection of ambulances, helicopters, fire trucks, tractors, boats, and sports cars. Also included are themed transportation sets and remote controlled cars. 2 years & up. Durable plywood construction, bold colors with natural accents and rubber, non-skid tires will make these vehicles a favorite in the classroom. 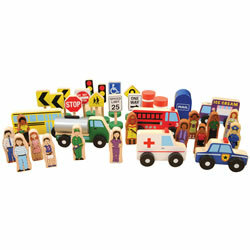 Bus measures 7"L x 5 3/4"H x 9 1/2"W. Set of 6 wooden vehicles. 12 months & up. 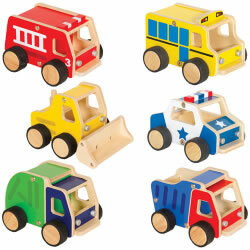 Get ready to roll with cars, trucks, planes, boats, helicopters, and construction vehicles in bold primary colors! Wheels roll, propellers spin! 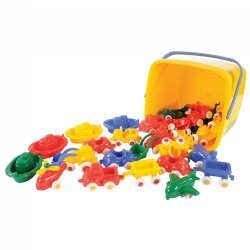 Includes clear storage pail with 30 various vehicles, approximately 3"L. These toys are dishwasher safe and have no sharp edges. The boats float for fun water play and the cars roll across the floor without making any noise or leaving any marks. 3 years & up. This sturdy wooden incline ramp invites children to explore STEM concepts through prediction and experimentation. 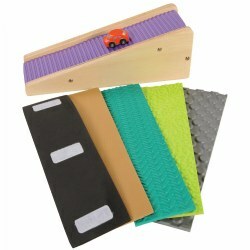 The six varying textures give children the opportunity to test the effects of surfacing, weight, and velocity on the potential speed and function of different objects. 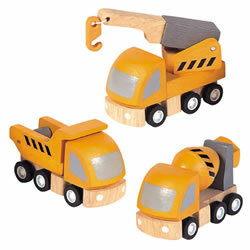 Ramptastic also introduces simple machines to children and is the perfect addition to the STEM toys in your classroom. Activity cards included. Cars sold separately. Measures 4 1/2"H x 4 1/2"W x 12 1/2"L.
4 years & up. This highly detailed set of 10 diecast safety vehicles will inspire community awareness and are perfectly sized for little hands to hold. Each vehicle is 3 inches long. 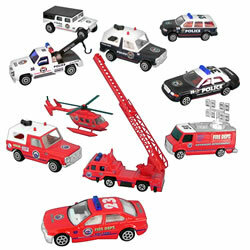 Set includes a helicopter, ambulance, ladder truck, and wrecker. 3 years & up. 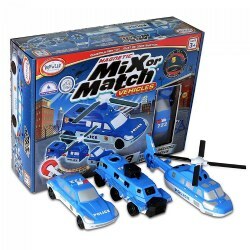 Mix or match police vehicle parts to create ultimate police machines! 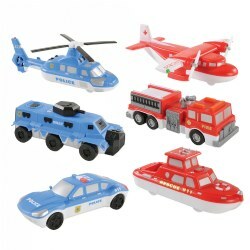 This unique building set allows your little engineers to use their imaginations to design and create their own police cars, helicopters, or SWAT vehicles. Hidden magnetic connectors make the pieces easy to connect and disconnect so they can build again and again. It's endless "Creativity on Wheels" and more! Included: 3 Pre-designed Police vehicles that can be taken apart and formed into new, unique designs. 3 years & up. Create realistic police and fire and rescue vehicles or mix and match to make a vehicle to fit your own design. Each piece is interchangeable with each other and the magnetic connections make each piece fit together in a snap. 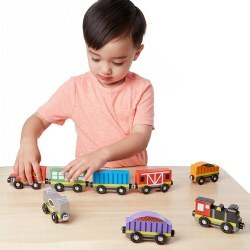 This set supports creative thought, fine motor development, and problem solving skills. 4 years & up. 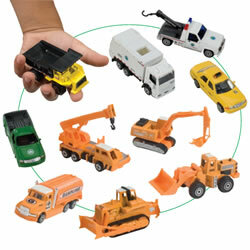 Children will enjoy playing with this set of die cast cars and construction vehicles. 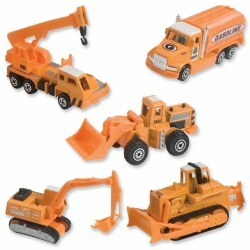 There are 5 New York City Vehicles and 5 construction vehicles for a total of 10 and each one is detailed of die cast metal. Measure approximately 3" long. Colors and vehicles may vary in this set. 5 years & up. Crafted from select hardwoods. Great to use with transportation toys. 3 years & up. 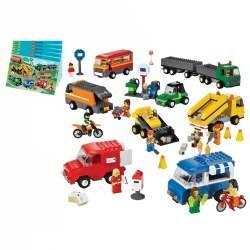 This Action City Construction Vehicle Set contains five vehicles of different styles and models. Made from die-cast metal and features incredible detail. Vehicles may vary. 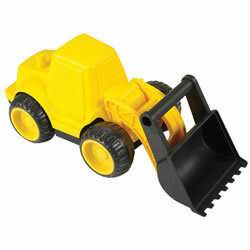 Includes 5 toy construction vehicles. 4 years & up. Bring the excitement of the Big Apple to your play area! 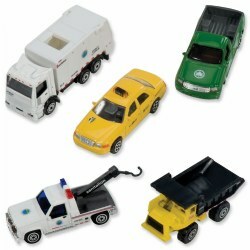 This New York City Vehicle Set contains five cars of different styles and models. Made from die-cast metal and features incredible detail. Includes 5 toy vehicles. 3 years & up. Build a sense of community, teamwork and cooperation through block play. 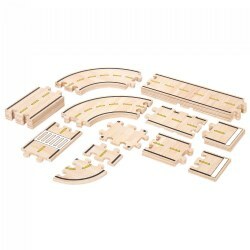 This large wooden set includes varied sizes and shapes of roadway (42-pieces), 6 community buildings with recognizable destinations, 6 vehicles, 12 traffic signs, 6 community workers, two 4-piece family sets, mailbox, and safety barrels. Unit blocks shown are sold separately. 3 years & up. All aboard for railroad adventures! Eight wooden train cars, each approximately 3" long, link together with magnetic couplers. Include a steam engine, caboose, coal car, passenger car, and more. Pieces store in the compartmentalized wooden tray. 3 years & up. An essential set of block accessories to compliment any block city or town. 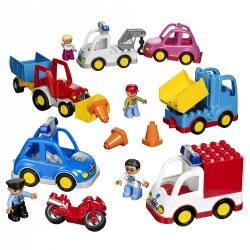 The 36-piece set includes 6 vehicles, 12 traffic signs, 6 community workers, two 4-piece family sets, mailbox, and safety barrels. Vehicles measure 2 1/2"H x 3 1/2"-4"W. Signs measure 3 1/4"H and people measure 2 1/2"H.
3 years & up. Imaginations will soar in the sky or at the airport as this plane goes on many adventures. 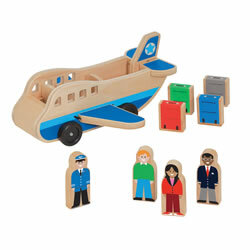 The wooden play set includes a plane loaded with four play figures and four color coordinated suitcases. 9 pieces. Airplane measures 4 1/4"H x 9 1/2"W x 3 3/4"D and figures measure 3"H x 1 1/8"W x 1/2"D.
18 months & up. When a big job is needed, call in this heavy duty working vehicle! Durable plastic body along with silent wheels makes for perfect indoor or outdoor play. The wheels leave real tracks in the sand. Colors may vary. 3 years & up. Just add a little imagination and going to or coming home from school, going on a field trip or to a sports event on this bus full of friends can become quite an adventure. 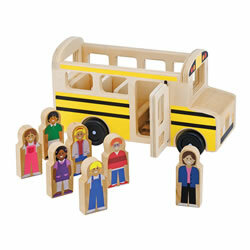 Includes wooden bus with working stop sign and doors, bus driver, and six figures to fill up the seats! 8 pieces. 2 years & up. 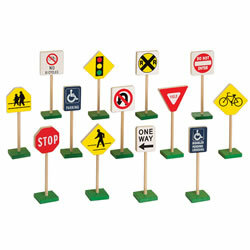 Build countless roadway configurations with this 42-piece set that includes various sizes and shapes of wooden roadway. These durable, hardwood veneered pieces are sized to work with unit blocks at a 5" standard width, and easily fit together like puzzle pieces. Ideal for large group play. Builds teamwork, cooperation, and enhances creativity and problem solving skills. Sizes range from 2 1/2" to 15" long. 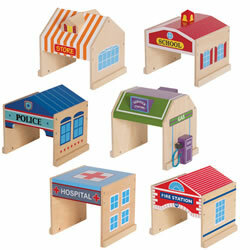 Community buildings, cars, people, unit blocks, and road signs are sold separately. 3 years & up. All aboard the train sensation! This amazing set includes everything needed for railway fun: a spacious roundhouse engine shed, dozens of tracks in curves and straights, trees, workers, and even traffic signs! 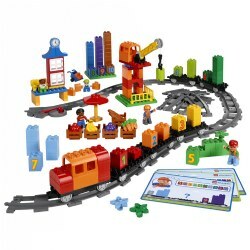 Contains multi-piece trains and magnetic-tipped cranes, switches and a T-junction for passing lanes! A suspension bridge, trestle bridge and roundtable, too! 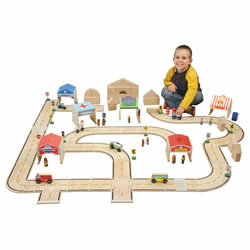 Constructed of solid wood, this set will provide years of enjoyment and fun! 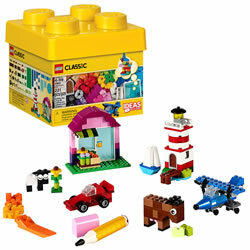 Set includes 132 pieces. 3 years & up. Keep highways in good repair with these three wooden maintenance vehicles that teach children their functions through play. This encourages imagination while they build their own city. Includes a dump truck, cement truck and a crane. Measures 3 3/8"W x 2"H.